Product recommendations, also known as “recs,” are a cornerstone to an effective ecommerce merchandising strategy. When fully optimized, recs typically increase retailer revenues by up to 5%. Personalization is what empowers retailers to create a 1-1 relationship with customers online. By tracking engagement and other KPIs, you can quickly take stock of how are you doing with those relationships. The new RichRelevance dashboard is the perfect tool for putting richer reports with more data at your fingertips, so that you’re always in tune with your site personalization. The new dashboard pulls back the curtain to showcase your data in a more digestible, visually appealing way. When your reports are eye-friendly, organized and automated, you can assess the status and impact of your site personalization within minutes. Here are three quick ways to dive into the dashboard. Our brand new Lookback Summary is a detailed tile band that displays an at-a-glance summary of your sales and recommendation metrics. You can configure the lookback period to be a day, week, month or any number of days up to 90. You can also click any tile to access an expanded view of the graph. 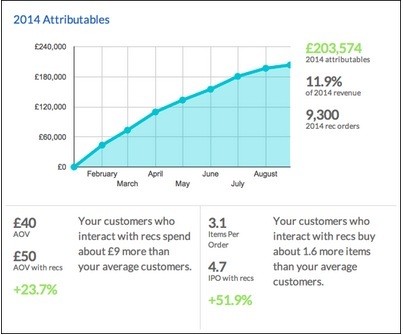 Take a screenshot and share metrics with key stakeholders in just a few clicks! The Attributables Report tile is another new addition to help you track the impact of RichRelevance recommendations on your site–specifically through change in average order value (AOV) and items per order (IPO). Other significant enhancements include the Page Type Performance tile, where you can view the performance of different metrics for various pages on your site, and the Viral Products tile, which displays the most viewed products and takes you to detailed Merchandising Reporting. Best of all, feature documentation can be accessed within the feature page itself. 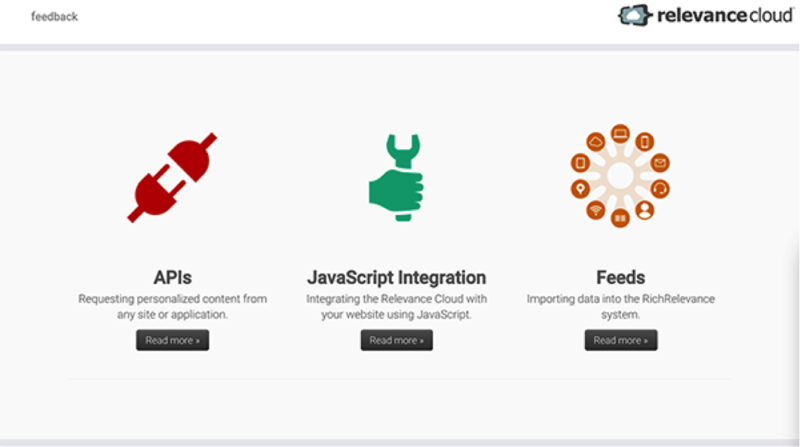 The new RichRelevance dashboard is designed to upgrade your experience and provide site health visualization, easy controls and usability improvements throughout. If you haven’t done so already, we encourage you to log in to your dashboard and play around. We believe that in order to provide you with more of the tools that you love, we need to work together. So, tell us what you’d like to see in the next set of improvements using the comments section below. Retailers are pinning some of their Christmas hopes on Pinterest, the digital media site. If Facebook is about friends and Twitter is about interests, then Pinterest is about things – and that is a welcome discovery for stores looking for ways to fuse social media and ecommerce. A loosely organised digital pinboard, Pinterest lets users post images of products they like, compile wish lists and browse the choices of others. Recent hits include a Gap striped hoodie, Tory Burch boots and a do-it-yourself picture frame made from Popsicle sticks. AllFacebook – How Does Facebook Fare In Terms Of Social Shopping? Facebook still dominates when it comes to social shopping sessions and driving traffic, but Pinterestcontinues to make up ground, while Twitter lags far behind, according to research scheduled to be released next week by personalized shopping data outfit RichRelevance.